Spring is the birth for a new beginning. Life starts from a passion of affection. Pollination begins with life’s connection. Plants bud, flowers bloom, and birds start singing. Mating rituals start with a dance of love. He sings his song to the one of his choice. She beckons his calling with sounding voice. A new generation they are thinking of. Hurry! Hurry! We need to make this nest. For I am with family can’t you see. I will build this nest from the very best. This is for you, me and the other three. Babies nestled under their mother’s breast. The fledglings were loved, nourished and had no need. During my seven decades plus, I had to see two of my pets pass on. I said “I can’t do this again”. But I lied to myself. At my elderly age I still wanted a dog. A dog that would out live me. I figured out my average life span and looked for a dog whose dog life would be a little longer than mine. I took in all factors other than accidental death. Thirteen years ago I got a toy poodle pup. I was still frisky and active, as was he. We have grown old together. I relate to his aching muscles, sore joints and frequent naps. We no longer take those youthful long playful walks. Our stride is short and somewhat staggering. Now we slowly creep through life. I lost a few teeth as he also, I have sagging skin, his no longer has that youthful tone. My hair is grey as his once jet black is now a dull grey. Each day he weakens. I feel I may see my friend and companion go before me. If so, its been an elderly pleasure to age together. My wife and I were dog sitting. Our friend, in the military, got orders for a six-month deployment and we promised to watch Sebastian. 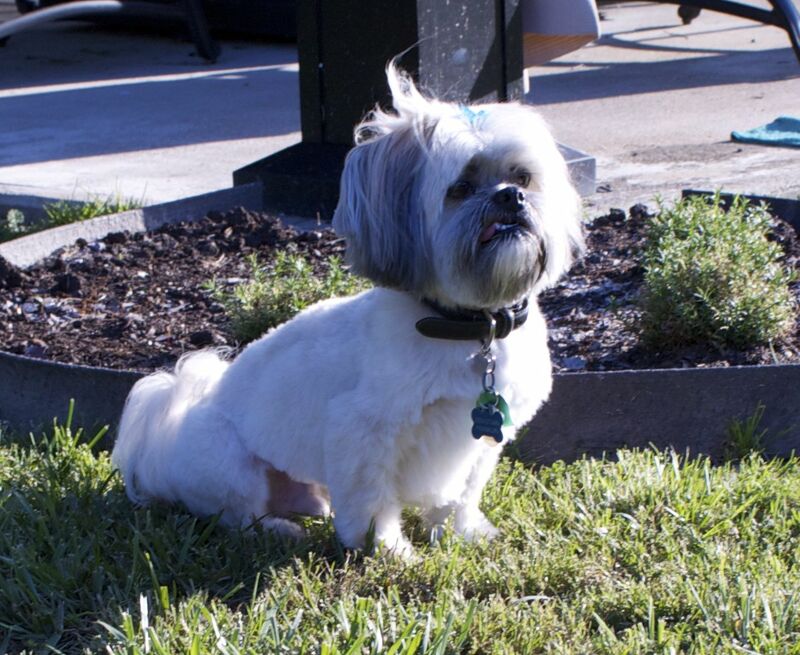 Sebastian is a six-year-old lhasa apso. One morning my wife left Sebastian out in the yard to do his morning routine. After 5 minutes, she opened the door and called for Sebastian. No Sebastian, my wife was worried, thoughts came to her mind; how will I explain this to Sebastian’s master that he had run away. She clapped her hands and kept calling his name. Finally, his little white hair body appeared from the neighbors yard, his tail tucked between his legs and his little pug face bowed to the ground. I am sorry about this morning. I know you were very worried and upset. I don’t know what happened to me. The morning was clear and crisp. I was so focused on the birds singing it just put me in a playful mood. The air was finally fit to breathe. I could smell things from a greater distance. There was this scent filtering through the air that lifted me right off my feet. I could feel myself being carried off to a far away place. I know you know that feeling. I have seen you focus on a TV show or read a book. You don’t hear anything around you. That was how it was with me. Then I heard hands clapping and my name being called. I looked around. I was really scared nothing looked familiar. I knew your voice. I ran towards the sound then it stopped. I didn’t know which way to turn. I was so scared I pee’d on some pretty flowers. Finally, I smelled something familiar and I followed the scent and it led me home. I was so excited when I saw you, but I knew the tone in your voice I was in a lot of trouble. I hope you will forgive me. I know I will be punished and I deserve it. Thank you for your love for me. I am one of many thousands that believe that all the universes and our little planet earth was created by God. I know I was put here on earth to be a servant to God. One of my jobs is to provide a well kept planet. I am thankful my little area of earth is filled with an abundance of healthy colorful trees, mountains and plants. The air and water meets the standard healthy grade as per our Government. It saddens me to see people in other countries wear masks to protect their lungs from the polluted air. The water not safe to drink due to high levels of poisonous chemicals. Plants are tainted with harmful substances that is unfit for human consumption. Animals dying by poachers in order to provide for a sinful need. Depletion of fish due to illegal means of catching. If I were to see God now, I think I’d see tears of sorrow and disappointment as he looks out over earth. A planet he created with love for our pleasure, contentment and unselfish needs. This is not the first time he has seen greed take the place of his blessings. All He ever wanted from us is to worship, love, obey, be righteous and give Him all the thanks and glory everyday, a simple request. How easy it is for greed to devour our earth. We must not be careless as we fullfill this charge. Like the creator, we should care for the earth responsibly and lovingly. It is great to know you are alive. I can feel your breath and hear you breathe. Your breath is like a feathery touch as it blows gently against my skin. The slow back and forth sway of the thin branches creak with each inhale and exhale of your breath. Your eyes open slowly. A beam of white light spreads above the darkness on the horizon. Patches of light fog filters the white glow. As the sun rises and the fog lifts, a bright, clear, new day begins. It’s like you are smiling and happy to see me. The sweet smell of life is all around. The potpourri of pines, persimmons and the musty scent of rich soil permeates the area. Drips of morning dew glisten on the patches of grass like a gentle mist sprinkled down from heaven. The choir of birds sing their chorus of melodies of joy as their day opens. It is like angels singing praise and worship as you watch over your children. Thank you Lord for my life, it is a pleasure to serve you and do your will. What would your life be like if you had no emotional contrast? A human life is filled with contrast. I can’t imagine a static mind or body. When I was young I had a mix of distinguishing characteristics. Now, what sets me apart from some people are my responses. Which side does your emotional contrast lean to? When I know I am focusing on the negative side, I refocus and set my mind on the positive side of life. If we stay focused on the negative side, it is like a cancer it will eat at you until you can’t handle that pain. It is better to lean to the positive side.